This amended Agreement is entered into this 1st day of August 2015, by and between the Mechanical Contractors Association of America, Inc., and its department, the Mechanical Service Contractors of America, hereinafter called the "MSCA;" and on behalf of contractors who qualify and become signatory to this Agreement, hereinafter called “Employer”, and the United Association of Journeymen and Apprentices of the Plumbing and Pipe Fitting Industry of the United States and Canada, AFL-CIO, hereinafter called the “United Association,” “UA,” or "Union." The current National Service and Maintenance Agreement between the UA and MSCA is in effect from August 1, 2015 - July 31, 2020. The National Service and Maintenance Agreement is an agreement negotiated and administered by the United Association of Journeymen and Apprentices of the Plumbing and Pipefitting Industry (UA) and the Mechanical Service Contractors of America (MSCA) and is a signed contract between the UA and individual mechanical service contracting firms who apply and qualify. The Agreement is a nationally recognized tool that helps contractors provide quality, consistent service to their customers throughout the country and helps reclaim lost market share. The Agreement covers all work performed by service, plumbing and refrigeration contractors to keep facilities and existing systems within those facilities operating in an efficient manner. This can include air conditioning, heating, refrigeration, plumbing, ventilation, building automation systems and total building operations. The Agreement specifically addresses the unique needs of service contractors while respecting locally bargained wages and fringe contributions. Where needed, a Schedule A addendum has been developed to address specific local needs and enhance contractors' competitiveness in those areas. When requesting the National Agreement, it is important to note that the United Association is the sole party in determining who signs the Agreement. However, the MSCA, as the bargaining representative of signatory contractors, is in an advantageous position to be an advocate for contractors who wish to sign the Agreement. Step 1: The service contractor should send a written request to Mark McManus, General President of the United Association, Three Park Place, Annapolis, MD 21401, Fax: 410-267-0262 with a copy to Anthony Gallagher, Director of HVACR Service, UA, at the same address. A copy should also be sent to MSCA, 1385 Piccard Drive, Rockville, MD 20850. The contractor should document the UA locals in which he is working and provide an explanation of why the National Agreement is necessary for his business. Step 2: The UA will acknowledge the request and will send copies of the correspondence to the UA International Representative in the area. Step 3: The UA International Representative will set up a meeting between the contractor, local business manager and himself for the purpose of familiarizing himself with the contractor's business and to complete the contractor's application. The International Representative will forward the contractor's application, along with his recommendation, to the UA. Step 4: If the recommendation of the International Representative is positive, an executed copy of the Agreement will be forwarded to the contractor by the General President of the UA for the contractor's signature. Once a contractor is an approved signator to the National Service and Maintenance Agreement, additional information will be forwarded from MSCA regarding its benefits, services, products and required payments to MSCA under the terms of Article XXII. A signatory contractor to the National Service and Maintenance Agreement is not required to sign a local agreement to perform any work which is covered under the scope of the Agreement. The working provisions and conditions as established in the National Agreement prevail over locally established provisions. However, signatory contractors are bound to the wages, fringes, benefits and other contributions as established in the local agreement. Although not required to sign a local agreement, signatory contractors must subscribe in writing to the local trust agreement. The scope of work covered by the Agreement includes all HVACR and plumbing work necessary to keep existing facilities and systems within those facilities operating in an efficient manner. This work can include the inspection, service, maintenance, start-up, testing, balancing, adjusting, repair, modification and replacement of mechanical, refrigeration and plumbing equipment and components including related piping connections and controls. In addition, any other service, maintenance and operations work as assigned by the customer as well as work on any temporary systems falls under the scope. The Agreement recognizes five classifications of employees: Service Journeyman, Serviceman, Service Apprentice, Tradesman and Probationary Employee. Service Journeyman: Must be a skilled craftsman having successfully completed a five- year apprenticeship training program and a minimum of five years actual practical working experience. Passing the UA STAR exam for Service Journeymen may be a requirement. Service Journeymen can perform all work covered under the NSMA. Wages, fringes and benefits for Service Journeymen are per the local collective bargaining agreement. Serviceman: Must have practical working experience in the HVACR or plumbing trades and may be required to pass the UA STAR exam for Servicemen. Servicemen can perform all maintenance work covered under the scope of the Agreement and all service and repair work on all systems with the exception of centrifugal and absorption machines and ammonia systems. A Serviceman's pay, fringes and benefits are per the Schedule A for the jurisdiction. Paragraph 15 - Servicemen - Revised 12/13. See Memo of Understanding. Service Apprentice: Are governed by the local apprenticeship committee and shall be allowed to perform all work under the NSMA limited only by their capability. They shall be under the direction of a Serviceman or Service Journeyman and their wages, fringes and benefits are established locally. Tradesman: The primary function of tradesmen is to perform routine maintenance tasks and inspections on all existing systems. A Tradesman's duties can be modified, to include facility operation, through an approved Schedule A. A Tradesman's wages, fringes and benefits are established under the Schedule A.
Probationary Employees: A contractor has the right to hire probationary employees for a period of up to six months, when neither the local union nor the UA can provide qualified manpower through the normal hiring hall procedures. The contractor must notify the local union prior to hiring a Probationary Employee, but the Employer is free to establish the wage rate and benefits (if any) for this Employee. This Employee is neither a member of the local union during the probationary period nor are any union funds or fringe contributions paid on behalf of this Employee. The value of a Probationary Employee is to provide the Employer time to evaluate the skills, work ethic and capabilities of this Employee prior to organizing into the union or hiring as a permanent Employee. After the six-month probationary period, the Employer will either dismiss the Employee or determine at what level this Employee will be placed in the local union (i.e., Service Journeyman, Serviceman, Service Apprentice or Tradesman). In order to effectively serve their customer base, Employers can assign Employees to work outside their home local jurisdiction for all work covered under the scope of the Agreement. If an Employee works in a local jurisdiction other than his own for more than eight hours in a week, the Employee needs to notify the local union where the work is being performed. In addition, if the hourly wage rate in the jurisdiction where the Employee is working is different from his home local rate, the higher wage rate will be paid after the first eight hours of work. An Employee's fringe benefits are always paid at the home local rate and are always paid to the home local fringe funds. The standard work day is comprised of eight consecutive hours and the standard work week is forty hours per week, five consecutive days, Monday through Saturday. A standard work day/week should be established for each Employee which should not vary from day to day/week to week except by mutual agreement. In certain situations, where a job cannot be performed during normal work hours or based on customer needs, a flexible work schedule can be established by mutual agreement of the Employer, Employee and local union. Wages rates and all contributions or deductions for fringe benefit plans or funds, union dues, vacations, holidays, sick pay, International Training Fund (ITF) and industry promotion funds are paid at the rate established in the local agreement covering service or as specified in the Schedule A for that jurisdiction. In cases of conflict between the local agreement and the National Agreement, the National Agreement prevails. Signatory Employers are not required to sign any local service agreements but may be requested to sign the local trust agreement. Employees will be paid for any travel time, before and after their normally established work hours, in excess of reasonable commuting time. Reasonable commuting time is considered the time it takes for Employees to travel to and from job assignments within a 50-mile radius or one-hour drive time. Travel time is paid at the straight time wage rate and no fringes. The no-strike, no-lock-out provisions of the National Service and Maintenance Agreement are an extremely important and necessary condition of the agreement. The service industry is a customer-based business insuring the comfort, safety and health of all building residents. As a result, customers must be assured that their service provider is always available to attend to the needs of their building's systems. If a service contractor were unable to respond to their clients, due to a strike for example, this would result in the immediate loss of that customer (and the likelihood they would never return) and a loss of hours and jobs for our service technicians. Therefore, in the event of a local strike, ALL service work, as defined in Paragraph 11 of the National Service and Maintenance Agreement, shall continue to be performed. This is NOT limited to emergency service work or scheduled PM work but any work necessary to keep a building operating. This includes all inspection, service, maintenance, repairs, start-up, testing, balancing, modifications and replacements of all mechanical, refrigeration and plumbing systems as described in paragraph 11. This also applies to all refrigeration work before performed under Article XXV of the Agreement. Under the terms of Paragraph 64 of the National Service and Maintenance Agreement, it is a violation of the Agreement for any local union or employees of signatory contractors to engage in a strike, slowdown, picketing or any interference with an Employer's service operations. Likewise, it is a violation for any signatory contractor to engage in any work slowdown or to lock-out any employee covered by the National Service and Maintenance Agreement. Any such violation of these provisions can result in the immediate filing of a grievance (Step 4b of the Grievance Procedure) with the possibility of claims or damages being assessed. In addition, upon termination of a local agreement, contractors signed to the National Agreement or a local union can invoke paragraph 73 and request implementation of a Schedule A. Such a Schedule A shall be implemented within 30 days of receipt of request and can include service wages and fringes. This paragraph also includes the option of submitting all unresolved issues to the Industrial Relations Council (IRC) as a means to settle all matters. (See sections on Schedule A and IRC). When to file a Grievance: When a disagreement exists between the Employer or a group of Employers and a local union or the UA regarding the intent, meaning, application or compliance with the terms of the National Service and Maintenance Agreement. Who can file a Grievance: A single signatory contractor, a group of signatory contractors, or a local union. Step 3: The grievance will be considered by the UA Director of HVACR Service and MSCA representatives, within 30 working days, with information received from both parties involved in the grievance. The joint decision of the UA and MSCA will be provided in writing to the grieving parties. If any or all parts of the grievance remain unresolved, the UA and MSCA will submit in writing all unresolved issues to the chairman of the Arbitration Board. Step 4: A hearing of the Arbitration Board will be held within 30 days of receipt of the arbitration request from the UA and MSCA. Representatives from all parties involved in the grievance will be present at the arbitration hearing. The Arbitration Board will make its determination within seven days following the hearing. If they are unable to reach a majority decision, the grievance will proceed to Step 5. Step 5: The grievance will be submitted to an impartial arbitrator or the IRC (if agreed to by both parties). The selection of an impartial arbitrator shall take place within 60 days. The decision of the impartial arbitrator will be delivered in writing and be binding on all parties. A Schedule A is an addendum to the Agreement for a specific jurisdiction which recognizes the unique conditions in the area by modifying certain provisions of the Agreement or implementing new language. The Schedule A is negotiated by a local Oversight Committee but must be approved by the Joint UA/MSCA Labor Committee and signed by the UA General President and MSCA Chairman. Once approved and signed, the Schedule A becomes part of the National Agreement for that particular jurisdiction and all contractors and local unions in that area are bound to its terms. A Schedule A can be requested by either a local union or a contractor signatory to the Agreement by written request to the MSCA or UA. A Schedule A can also be implemented upon termination of a local agreement covering service. In such cases, the Schedule A is negotiated by a committee appointed by the Joint UA/MSCA Labor Committee and must be finalized within 30 days. If the local committee cannot resolve all issues within that time period, all unresolved issues will be submitted to the Industrial Relations Council (IRC) for resolution. Oversight Committee members are appointed by the Joint UA/MSCA Labor Committee with input from the local MCA exec and international rep. The committee consists of an equal number of local contractor representatives for management and local business managers for labor. All MSCA-affiliated local association executive(s) within the jurisdiction, local training coordinators, recruiters and the UA international representative should be invited to each meeting in an advisory capacity only. The committee elects its own chairman and secretary. The chairman is responsible for setting up the meetings and notifying all committee members of meetings. The secretary is responsible for keeping minutes and notes. These positions should rotate annually between management and labor. Meetings should be held two to three times a year whenever possible. Training coordinators should be invited to meetings at least twice a year to report on local training activities/program. The committee should be encouraged to visit local training centers. Following each meeting a report, including meeting agenda and minutes, should be sent directly to the UA General President and the MSCA Executive Director. This report should also include information on when the meeting was held, who was in attendance, items which were discussed and any recommendations for revisions to the Schedule A which should be considered by the Joint UA/MSCA Labor Committee. Typically an Oversight Committee oversees a geographic area which expands over several local union jurisdictions, or in many instances an entire state. Thus the composition of an Oversight Committee is broader than any one specific local collective bargaining committee. The Oversight Committee is not a local collective bargaining agreement negotiating committee. To quantify the number of service labor hours being worked within the jurisdiction. This is important to help track service growth and market share. To establish a joint local recruitment program to attract qualified workers to the service industry and ensure young people, parents and guidance staff understand the value and benefits of a career in the HVACR industry. The committee should strive to identify local technical career training schools, develop partnerships with such schools and encourage their graduates to enter local apprenticeships through direct entry. To promote the value of "green" mechanical service and energy services. This should include ensuring "green awareness training and certification" and "energy audit" training is offered locally for all technicians and sales personnel, encouraging MSCA contractors to participate in MSCA's GreenSTAR program, incorporating green training and energy services into local apprenticeship programs and utilizing the UA's mobile training trailer for local training, public relations, recruitment and educational purposes. 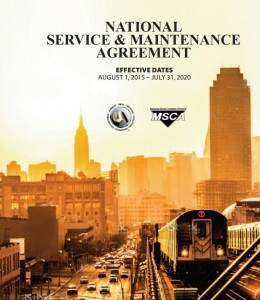 The Mechanical Service Contractors of America (MSCA) administers and negotiates the Agreement on behalf of contractors who qualify and become signatory to it. The MSCA does not hold the bargaining rights for any signatory contractor – each contractor must apply for the Agreement directly with the United Association and sign the Agreement directly with the UA. Once signed, a signatory contractor does not automatically become a member of the MSCA but is considered a signatory contributor and provided with additional information on how to become a full-fledged member. MSCA serves as an advocate for all signatory contractors providing advice, recommendations and representation if any questions arise or any grievances occur. The MSCA works with local signatory contractors and Oversight Committees in the development of Schedule A's. Signatory contractors are obligated to contribute to MSCA at the current 2014 rate of $.07 per manhour for all hours of work performed under the Agreement. This includes all work performed by all classifications of service employees both within their own home local unions and work in any other jurisdictions. Failure to make such payments can result in termination of an Employer's National Agreement. A minimum of 4,000 hours of work per year are required to maintain a National Agreement. Payments to MSCA are in addition to and not in lieu of payments made to any other local, area or standard industry promotion fund. The current Agreement is in effect through July 31, 2020, and from year-to-year thereafter. The Agreement can be terminated by either the UA or a signatory contractor by giving to the other written notification of termination by June 1st of each year (60 days notice), with the termination to become effective August 1st of that year. All signatory contractors are bound to any amendments, modifications, changes, extensions or renewals to the Agreement as negotiated by the MSCA and the UA. A Joint UA/MSCA Labor Committee serves to negotiate any modifications to the Agreement and explain and interpret the provisions of the Agreement. The committee is comprised of equal representation from the UA, including business managers from around the country, and MSCA, including contractor representatives. The Committee meets three to four times a year to discuss the Agreement, deal with any questions or issues which arise, develop Schedule A's where required, promote service training, ensure the recruiting of qualified technicians, enhance service business opportunities and jointly promote the HVACR industry. A contractor can utilize the National Service and Maintenance Agreement to install and remodel all new and add-on ammonia and supermarket refrigeration systems, cryogenic cold box systems and ice rinks. The Agreement contains certain provisions which can enhance the competitiveness of contractors performing this type of work including travel of regular work force employees into other jurisdictions and other work terms. However, Employers doing this type of work must comply with the terms of the prevailing local agreement where the work is being done as far as working conditions, rates of pay and fringe contributions. This Agreement covers any work necessary to keep existing plumbing systems operating efficiently. It also covers the installation and replacement of all residential single unitary plumbing systems – work which can be done utilizing the Tradesman classification. The installation and service of pneumatic and DDC controls is covered under the terms of the National Agreement in a separate addendum. If contractors plan to undertake this type of work, they should make sure they also sign this addendum which is included in their National Agreement. The addendum provides for special working conditions for this type of work, including portability of employees and flexible working conditions, to foster growth in this field. However, due to the complexity and sophistication involved with the programming of control systems, and the very technical specialized skills training which may be required to work on such systems, programming cannot be limited to bargained employees but needs to be performed by those individuals that the Employer deems qualified and have the required training and special skills. A site-specific Facility Operations Schedule A allows contractors to take advantage of opportunities in building operations and management and to employ additional local union employees to perform this work. Facility Operations Schedule A's are negotiated directly with the UA for a specific facility. Provisions in the National Agreement allow employee classifications to be redefined with this Schedule A to permit contractors to perform all in-house maintenance functions utilizing mutually agreed to wage rates and working conditions. Today's economic climate has motivated corporations to reevaluate operating expenditures. Many of these companies find that subcontracting facility operations to service contractors allows them to eliminate their in-house work force, along with all the headaches inherent in maintaining that work force, and realize substantial cost savings. The National Agreement gives contractors the tools needed to customize an agreement for a specific building to satisfy the needs of facility management. Once a working relationship is established with a building owner, it is natural for additional service and maintenance, remodel, or new construction projects to go to your company. Flexibility to include the national pension plan and company-sponsored insurance in the Schedule A.